I would like to configure the Extreme Switches (x440-G2, with version 22.4) to sending sflow/netflow data direct to the Extreme Analytics. I heard this is now possible without having a flowcollector enginge like PV FC-180 installed. Is this true? Because I couldn't find any referenced documentation to this. Thank you very much for your feedback. An error has occurred while adding a flow source to the selected engine. See details below for more information. WARNING: Configuration of double width access-list is not supported when Policy is enabled. Slots will remain in Single width mode. 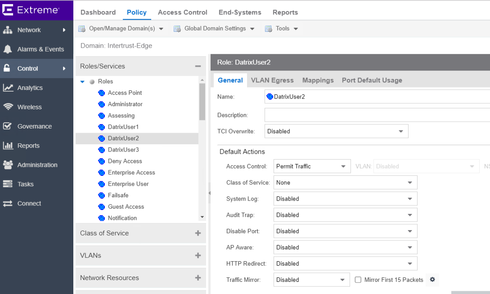 Warning: Enabling Policy will cause some Netlogin settings (such as VLANs and dynamically created VLANs) to be cleared. ERROR: Hardware resources could not be reserved for Policy (count 0). Note that Policy cannot be enabled when double width access-list is configured or operational. Post mentions this being fixed in version 22.5, so not sure what I am doing wrong or how to fix / get this working? I've tried removing no-ipv6, but no difference? that's certainly a wise decision, playing all around with the ACL config as you did, you may have some leftovers. So I've tried all the above and removed all the QoS config I can, but still the ACL slices will not budge, so no idea what's using them? Think the only way I'm going to be able to straighten it out I think is wipe the switch and start again. Thanks for all your effort anyway. Thanks Stephane, shall try this out and post back. I haven't got double width enabled. I did try it, but removed it as I couldn't enable policy. btw, you are not using double width ACL, right? You should not. A fresh x440G2 (default config) should use only 1 slice. Telemetry + Policy should leave you with 1 slice free. This will require disable/enable policy but will effectively reserve/consume only 2 slices (instead of 4) for policy. configure qosscheduler strict-priority ports "Default (TXQ.0)"
configure qosprofile QP1 maxbuffer 100 weight 1 ports "Default (TXQ.0)"
configure qosprofile QP2 maxbuffer 100 weight 1 ports "Default (TXQ.0)"
configure qosprofile QP3 maxbuffer 100 weight 1 ports "Default (TXQ.0)"
configure qosprofile QP4 maxbuffer 100 weight 1 ports "Default (TXQ.0)"
configure qosprofile QP5 maxbuffer 100 weight 1 ports "Default (TXQ.0)"
configure qosprofile QP6 maxbuffer 100 weight 1 ports "Default (TXQ.0)"
configure qosprofile QP7 maxbuffer 100 weight 1 ports "Default (TXQ.0)"
configure qosprofile QP8 maxbuffer 100 weight 1 ports "Default (TXQ.0)"
configure meter ingmeter2 committed-rate 10000000 Kbps out-actions drop ports "Default (IRL.1)"
configure meter ingmeter3 committed-rate 10000000 Kbps out-actions drop ports "Default (IRL.1)"
So apologies if this might seem like a daft question but do you know how I can fully remove all the CoS settings, perhaps just by manually removing all the config above? I tried removing the meters but it complained about being in use elsewhere, probably the 'configure dot1p' command. Before I start removing all the config, and its only a POC so its no big deal, I just wanted to see if there was an easier way and that I'm going about it correctly. fwiw, you should be able to have telemetry and policy on the x440G2, but I doubt you can have CoS settings as well. You should check why you still have a cos configured. did you try without the meters? No worries. Thanks for helping out on this Stephane. It is quite a challenge, just doesn't seem a clear way to see what's using the slices. Even when policy is disabled and all the ACL config is removed 3 are still consumed, but not sure what? Tried everything I can fined from compression, shared, dedicated, double ACLs, but nothing is effecting or reducing the values. You should not see that line imho. But even after an enforce the cos value stays persistent in the policy configuration on the switch? So manually removed this but still no difference to amount of ACL slices used. for testing purposes, I'd try to disable the meters, and try to use a light Policy with Telemetry. 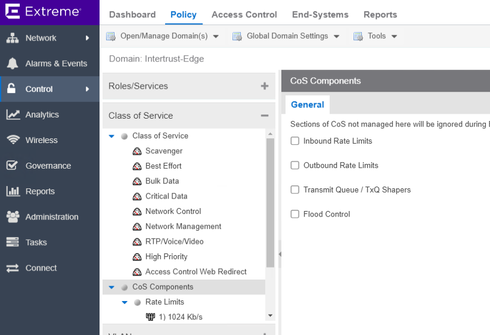 If possible, can you make sure for your Policy TCI Overwrite is disabled as well as CoS (if not needed, of course)? Thanks for posting back. I've currently disabled policy and re-run the Telemetry configuration via EMC, just to see it would take, which it did. Problem is I can't enable Policy again because its out of resource. So least I know it works with one or the other but never both. Virtual Slice : (*) Physical slice not allocated to any virtual slice. configure meter ingmeter2 committed-rate 1024 Kbps out-actions drop ports "Default (IRL.1)"
configure meter ingmeter3 committed-rate 2048 Kbps out-actions drop ports "Default (IRL.1)"
Is there anyway to see what's using those 3 slices when both policy and telemetry are disabled, maybe those meters? Resource Type Current Maximum % Util. can you show the output of "show sflow hardware-utilization"? Ok thanks for the information, I will contact Extreme GTAC. Hello Kevin, 22.4.1.4-patch2-5 is a private patch and is not publically available. You can get this patch by opening a case. 22.5 will also contain the fix once it is available (expected end of May). Ok thanks for the information. The firmware 22.4.1.4-patch2-5 isn't yet available at the partner portal of Extreme Networks? Hello everybody: I got the following information: To use an ExtremeSwitching X440-G2 switch as an Application Telemetry source for ExtremeAnalytics, install firmware version 22.4.1.4-patch2-5 or higher.